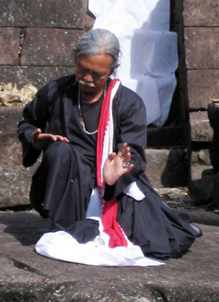 Since 1970, Suprapto Suryodarmo has studied free movement, Vipasana and Sumarah (Javanese meditation techniques). In 1974 he has created Wayang Buddha (The Buddha’s Puppet). The main intention of his work continued as an exploration of how to make less of identification through the practice of movement arts.He has founded the Padepokan Lemah Putih in 1986. Suryodarmo has initiated many festivals, in Indonesia and abroad. Among them were the Pasamuan Seni dan Ketuhanan, Pasamuan Seni Desa, Grebeg Lawu, sharing movement, and Web Art Garden. Surapto Suryodarmo’s performance is deeply rooted to the essence of ritual and its relationship with the nature and spirituality. He uses Ameta Movement technique as the main element of his performances. Since the 1983, Suryodarmo has given workshops and performances continues to present workshops and performances in Europe, Australia, The Philippines, Japan, and recently in the U.S.A, and many others.